Of course some customers are capable of performing their repairs and maintenance themselves. We support them too by supplying spares, if not from stock, but as speedy as our suppliers allow, another reason for selling a range reflecting our own desire of speed and efficiency in our supply line. Most of the spares that we supply are done so within 2 or 3 working days. There is such a vast range of machinery available these days from the various manufacturers, produced over many years, (gone are the days when there were only a couple of manufacturers with only a couple of models each). The manufacturers all use their own spare parts, to ensure that once they have sold a product they have an in-built future income, because people have to return to them to maintain and repair. Probably the worst scenario of this is a manufacturer who can produce in some instances 20 – 30 varieties of the same model name (the one you see blatantly somewhere on top in an easily visible place), but they can all use a variety of spare parts, creating for each variation a different production number. 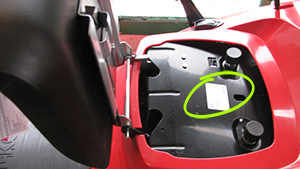 This means that when you go shopping for your replacement parts, even a mower blade, the only way the correct one for your machine can be identified is through its original manufacturer’s identity for your machine. You will locate, again depending on the make and model an I.D. plate or label, showing product/pnc/model numbers. 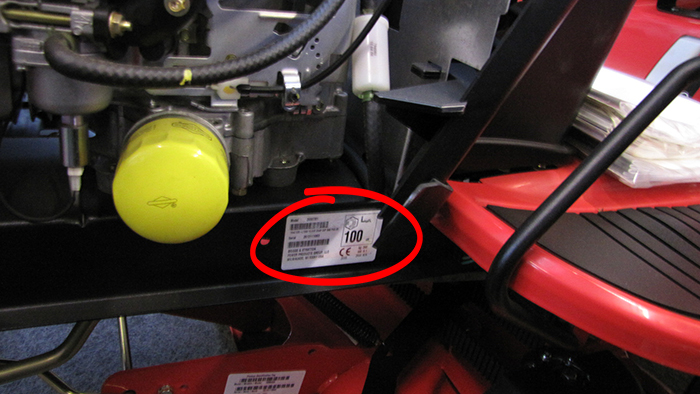 This label will also show the unique serial number for your machine and often also the year of production. Engine parts will be from a different manufacturer to the rest of the machine and thus require their own set of identification information. 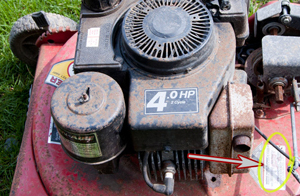 On engines it is stamped into the metalwork of the engine and therefore cannot be accidentally removed. 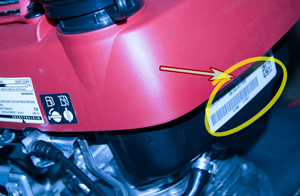 All parts identification processes involve a combination of all or some of these details. Most customers, when they first approach us to supply spare parts, do not realise this, resulting in an extra journey to find the information needed. If you are reading this, please help us to help you – come armed with the information. The parts themselves do not always show the part numbers, and where they do, often it’s an incomplete number of little help. To give you some idea of what the ID labels look like and where to find them we have compiled what we hope to be a useful guide.